Hong Kong people get excited every time they see the flashy van with the red-blue colors, approaching to the tune of “The Blue Danube”. 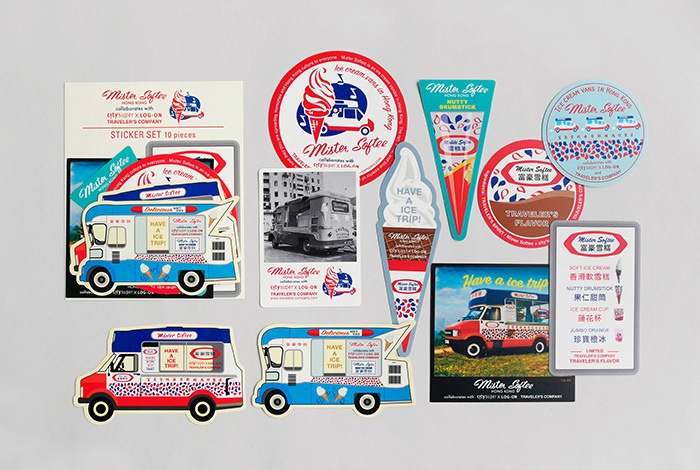 Mister Softee is a signature of the Hong Kong local culture since the 1970s. The ice cream is by many locals and travelers all over the world. 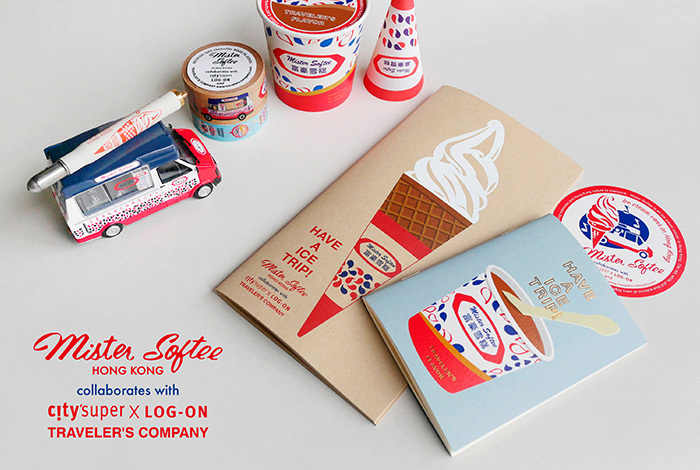 TRAVELER’S FACTORY collaborates with LOG-ON, the lifestyle store in Hong Kong, to bring the all-time favorite Mister Softee to TRAVELER’S notebook. The collection includes;　Two types of TRAVELER’S notebook refill: regular size and passport size. The illustration of the soft cream is designed on the front cover of the regular size refill. If you hold the notebook roll up, it looks like you are holding actual ice cream with the illustration of fresh ice cream. As for the passport size refill, the signature take-away ice cup is printed. The cotton bag design is inspired by the actual plastic bag for take-away. Masking tapes and Stickers designed soft cream menu and with red-blue colored vans will be released. And Brass Ball Point Pen also be released. On July 21, 2017, LOG-ON X TRAVELER’S FACTORY POP-UP STORE in Hong Kong will be launched at Cityplaza, the heart of Eastern district where the different cultures meet. The collaboration items will be available there. The POP-UP STORE will be open until August 6. In Japan, the collaboration items will be launched from August 2nd at TRAVELER’S FACTORY. Whether or not you are able to be in Hong Kong, let’s survive the hot summer, imaging you are actually eating Mister Softee’s cold ice cream. At the venue, the Mister Softee collaboration items, TRAVELER’S FACTORY original items and TRAVELER’S COMPANY products will be sold. The Mister Softee collaboration items will be sold at TRAVELER’S FACTORY starting August 2 in Japan. 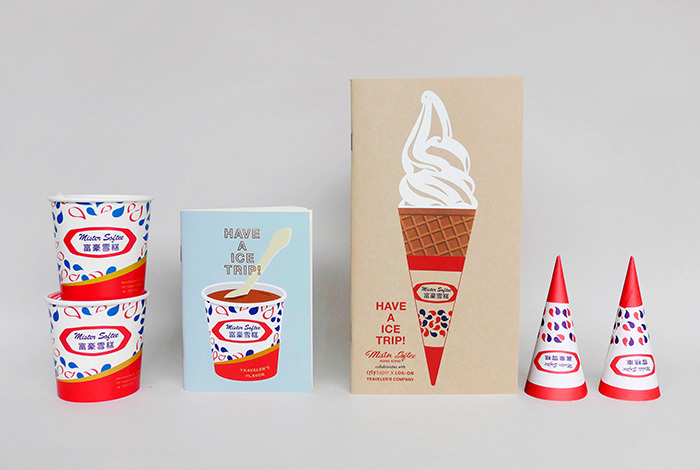 The illustration of the soft ice cream is designed on the front cover of TRAVELER’S notebook regular size refill. If you roll up the notebook, it looks like you are holding actual ice cream with the illustration of fresh ice cream. As for the Passport Size refill, signature take-away ice cup is printed. 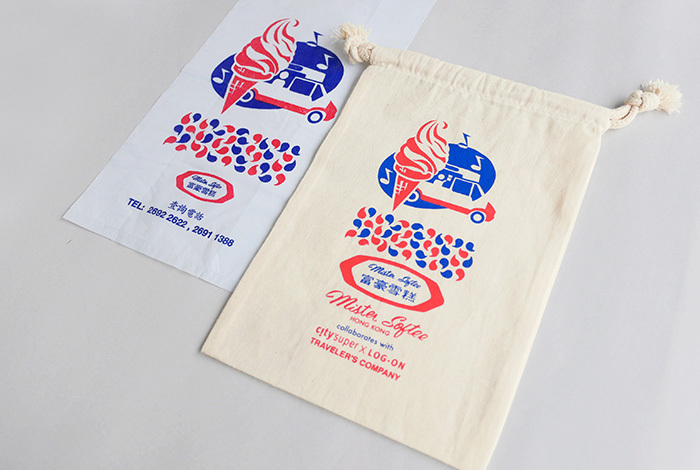 Cotton Bag is designed inspired by the actual Mister Softee’s plastic bag for take-away. Mister Softee is a signature of the Hong Kong local culture since the 1970s. Stickers bring about a sense of nostalgia, a warm reminder of the different looks these vans had in the past. 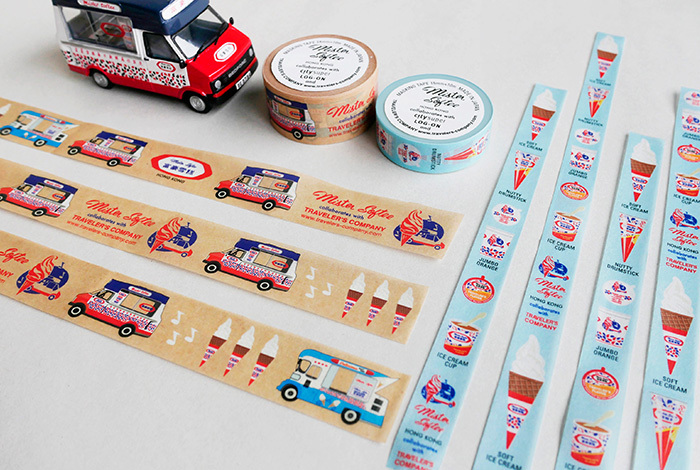 Masking Tapes are designed with the red-blue colored vans and with the ice cream menu items. Customize your notebook using this! 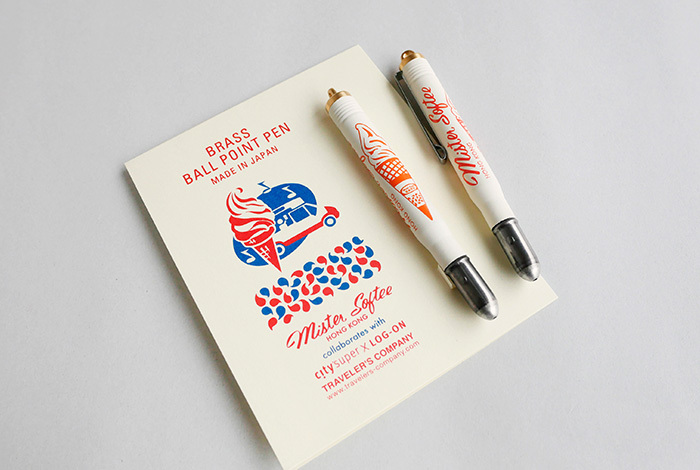 Brass Ball Point Pen with the illustration of the soft ice cream will be released. You cannot taste the ice cream printed on the pen but has excellent writing touch.